Look into replacing your windows to cut energy bills? One way that Midlands households can cut their energy bills without the need to spend thousands of pounds on investments such as double glazing is to look at replacing only the window and not the frame. Ron, who owns green energy company Noreus on Stafford’s Technology Park, said windows which are more than ten years old have a very low F rating for energy efficiency, whereas the frames can last up to 30 years. The first step would be to have a free thermal imaging camera survey. It may show, for example, that the room temperature is 20 degrees but the glass is 16 degrees and the frames 12 degree, possibly revealing problems with the seals or a gap between the plastic frames and the house wall. According to the Energy Saving Trust, a non-profit organisation funded mostly by the Government to promote the use of green energy, replacing the windows could save householders up to £170 per year in their bills and should last 20 years. The trust said other advantages are a more comfortable home with fewer draughts and cold spots, more peace and quiet plus less condensation. Also this move produces a smaller carbon footprint because by using less fuel a resident will generate typically 680kg less carbon dioxide a year. But the green organisation said energy efficient windows vary depending on how well they stop heat from passing through the glass, how much sunlight travels through the window and how little leaks in or out. They pointed out the most energy efficient glass for double glazing is low emissivity (Low-E) which often has an unnoticeable coating of metal oxide, normally on one of the internal panes next to the gap. This lets in light and heat but cuts the amount of heat that can get out. Also in between the gap of sheets of glass very efficient windows might use gases such as argon, xenon or krypton. Ron added that residents should look for replacement windows with trickle vents incorporated into the frame to let in a small amount of controlled ventilation to reduce any condensation. 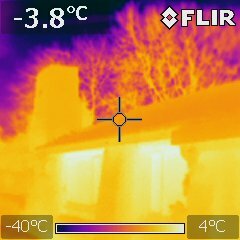 He the thermal imaging camera also reveals air leaks and moisture in cavity wall insulation, water problems in flat roofs, defects in pipes or under-floor heating systems and inefficient seals around door and windows without having to cut into plasterboard or concrete or search through the attic.